I made this for my family for Holiday. WE LOVE IT!! It is SO easy and very delicious. 1. Preheat oven to 350 degrees F. Spray a jelly roll pan with non-stick cooking spray, set aside. Prepare chocolate cake according to package directions. Pour batter into prepared pan and spread around until it's even. Bake for 15-20 minutes. Remove cake and let cool for 30 minutes. While cake is cooling, prepare the middle layer. Cream butter and shortening in a large mixing bowl. Gradually add remaining ingredients and beat until mixture is thick, combined, and spreadable. 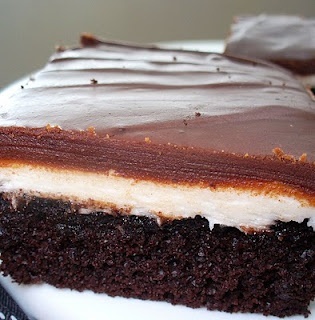 Spread in an even layer on the chocolate cake. Set in the freezer for 15 minutes while you make the chocolate glaze. In a medium size pot, melt the butter over medium heat. Add the cocoa powder and whisk until smooth. Remove from heat and mix in the powdered sugar and milk. Remove cake from freezer and evenly frost with the glaze. Store in the refrigerator.